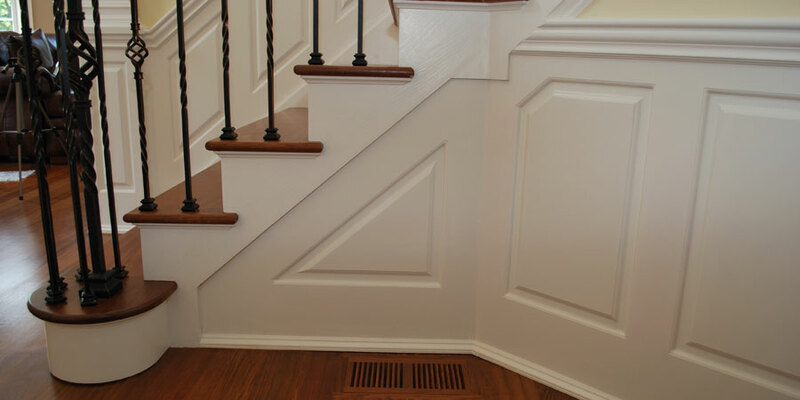 Custom Staircase Wainscoting has never been easier. Will assist with How To measure the slope accurately. Tall Double Panel Wainscoting that is 60 inches in Height. The upper inner panel is usually square or almost square. Custom Bathroom Raised Panels are Custom made to be Centered Behind Sink and Toilet Fixtures. Typical Panel Height is about 40 Inches in a Bathroom. Conference Room in the Delamar Hotel, Southport CT. This room feature full wall wainscoting, hidden doors and a curved bar. We fabricate custom raised panels for Oval Office Design LLC. They are the predominant authorities in Oval Office replicas. Faux Painted Wainscoting of a Dining Room located in Fairbanks Alaska. This Photo Gallery Inspires You To Explore Some Dramatic Colors. Custom Coffered Ceiling With Raised Panel in a Bedroom Located in Westerly Rhode Island. Shaker Wainscoting Panels have simple lines but add elegance to any room. See Standard Height and Full Wall Wainscoting. Wainscoting Staircase and Top Cap Molding Panels that are being installed.